Save the Date! Dog Days of New Canaan on May 4! The 10th annual New Canaan Dog Days presented by Pet Pantry Warehouse will be hosted at the New Canaan Nature Center, 144 Oenoke Ridge on Saturday, May 4. This year's event is a celebration of dogs and features a marketplace filled with quality food, treats, toys, arts, crafts, and local services. 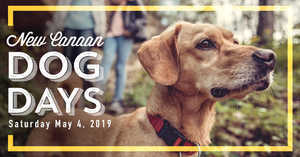 This year, the New Canaan Dog Days event is kicking off with a fundraising Pet Pantry Paws Walk through the Nature Center trails beginning at 10:00 am. Participants are required to register for the Paws Walk and a $20 fee will benefit both Adopt-a-Dog and the New Canaan Nature Center [check back for the registration link]. Following the Paws Walk, there will be demonstrations, lectures, and meet-and-greets beginning at noon. The New Canaan Police Department Canine Unit; New Canaan Nature Center Wildlife; professional dog trainers, dog behaviorists, and veterinarians will be in attendance to educate and entertain attendees. · The Fur-tastic K-9’s from Texas is a performance and stunt team that will give two performances and teach a trick workshop. Participants will learn how to transform their dog into a "trick star" (www.thefur-tastick9s.com). · The Pet Pantry Bone Bar with tuxedo-clad Bark Tenders. Event attendees can get the top of the line treats, chews and cookies for their dogs. · Family and pet portraits with Venture Photography. Visit the Facebook Event Page here for additional information.